I’m sure we’ve all been there: restless and torn at being in an unhappy relationship, but you just can’t seem to face ending it. Or perhaps, you care so little about the person that you can’t actually even be bothered to break up with them yourself? Or maybe you want a shot at staying friends and think someone else delivering the news will help somehow. 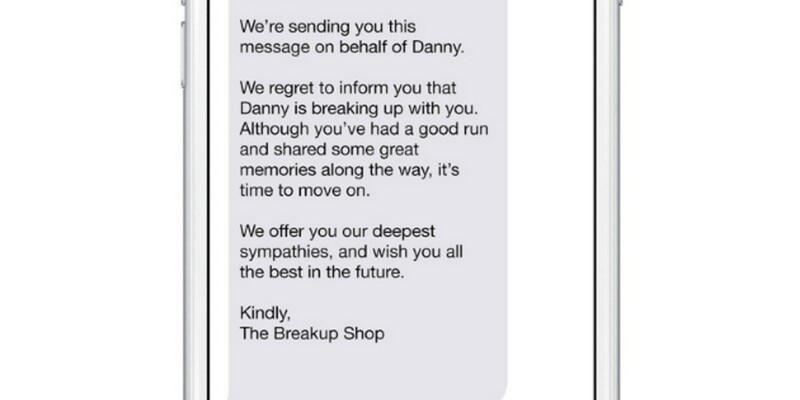 Either way, The Breakup Shop is happy do the nasty work for you. On offer is a standard break up text ($10) or email ($20), or you can personalize the latter with specific details for $30 instead. Alternatively, you could get one of the company’s Heartbreakers to deliver the news with words from an actual person. Just not you. That costs from $29 upwards. You’ll need to give The Breakup Shop a few days notice for most orders, or pay a little more for a one-day rush option. Even weirder, perhaps you could have the news delivered alongside a $95 gift pack to soften the blow? I’m not so sure the person being dumped with the words “We regret to inform you” will agree that the service is for “maximizing potential for long-term friendship” though. At least, not without that gift pack.